Version 3.0 of the highly successful Dolphin Watch app has been released this week thanks to the efforts of our mobile developer Gary, app design guru Tracey and software engineers Serge and Tony along with the amazing River Guardians team and scientists at Department of Biodiversity Conservation and Attractions(DBCA), Curtin and Murdoch unis. Tracey and Marnie from River Guardians also made a new Dolphin Watch App video tutorial. Several innovations have been made in this major release of the app. Orcaella heinsohni – Australian Snubfin Dolphin. Dolphin observations can now be recorded and contributed for any area of Western Australia. Trained Dolphin Watchers will continue to be able to undertake surveys of the Indo-pacific Bottlenose Dolphin in the Swan-Canning River Park. Further work in the new year will see a further release of the app with additional survey zones for Mandurah, the Kimberley coast and extending to other parts of Australia! This app release is built using our new ‘Hydra mobile’ technology that provides a faster and more flexible development environment for delivering mobile apps for citizen science users paired with an administrator dashboard for accessing and managing contributed data and user details. You will read more about other new apps for Urban Wildlife and MicroBlitz in coming months built on this platform, with more to come. 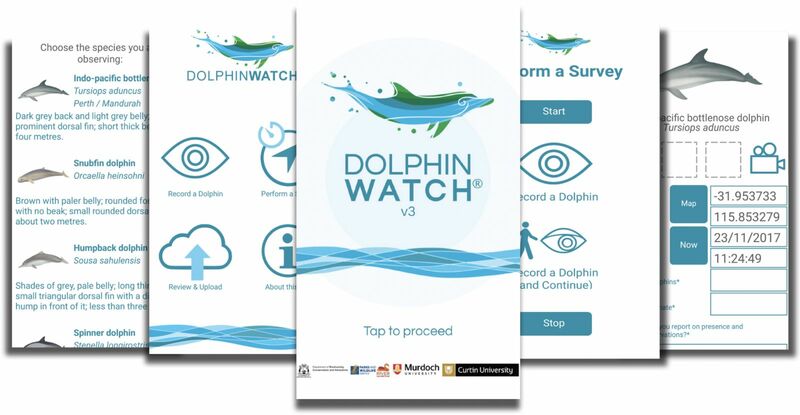 You can download the Dolphin Watch 3.0 Android app now from the Android Google Play Store and shortly the iOS version from the Apple iTunes App Store. If you’d like to know more about how we can help you with developing a citizen science program, or how a smartphone app could improve your community engagement and scientific data capture, then please leave a comment below – or email me directly via alex.chapman@gaiaresources.com.au. Or, feel free to start a conversation with us via Facebook, Twitter or LinkedIn.